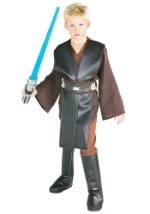 Wield this Plo Koon costume lightsaber like a pro in one of our Plo Koon Jedi Halloween costumes. The blue Star Wars accessory extends to over 3 feet long! The blade lights up with a flick of the "on" switch located at the bottom of the hilt (requires two AAA batteries - not included). Embody this Jedi High Council member when you add this costume lightsaber to any style of our Plo Koon Halloween costumes.